This is a sweetheart of a story. I enjoyed every page of this book. Rodzina is part of a group of orphans that is being sent out West on the Orphan Train. Rodzina is grumpy and grouchy. She is also frightened and lonely. Unlike the other orphans in the group, she came from a happy home and had loving parents. She is drawn to Miss Doctor who is in charge of the girls on the train even though she seems uncaring and cold. The idea that a worman can be a doctor is a wonder to her. Rodzina does have a gift for organizing and caring for younger children. Some of my favorite parts of the story are where she tells stories to the other children. She is a wonderful storyteller. The children's desire for a family is touching and heart breaking at the same time. Rodzina is looking for a home and you cheer for her as she reaches for it. This book has been well researched and it shows in the details. I am a fan of Katherine Cushman; this is my very favorite book of hers so far. 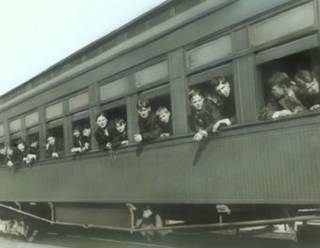 If you are interested in more stories on this topic, you might try the Orphan Train Adventures by the late, wonderful Joan Lowery Nixon. They include: A Family Apart, Caught In The Act, In The Face of Danger, A Place to Belong, A Dangerous Promise, Keeping Secrets, and Circle of Love. She also started a series called Orphan Train Children which includes David's Search, Will's Choice, and Aggie's Home. Train to Somewhere by Eve Bunting, 1996, demonstrates that just because it is a 32 page picture book doesn't mean it is an "easy" story. Orphan Train Rider: One Boy's True Story and We Rode the Orphan Trains, both by Andrea Warren are nonfiction reads that will bring tears to your eyes.